with almond milk, bacon, and white cheese. Funny story: I hate soup. No, let me rephrase. I used to hate soup. With age comes wisdom and a better-developed tastebud. I can’t say that I’m utterly in love with soup, but I’m slowly discovering new flavors in the soup department. 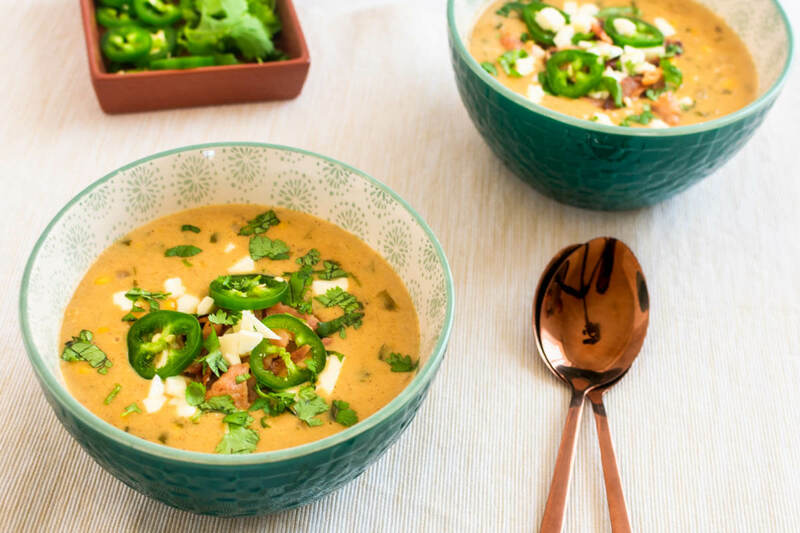 My latest experimentation is this Mexican Corn Soup recipe. One thing that I’ve always loved about making soup is how easy it is to make. You basically have to just add all ingredients to a pan and let it do its thing. 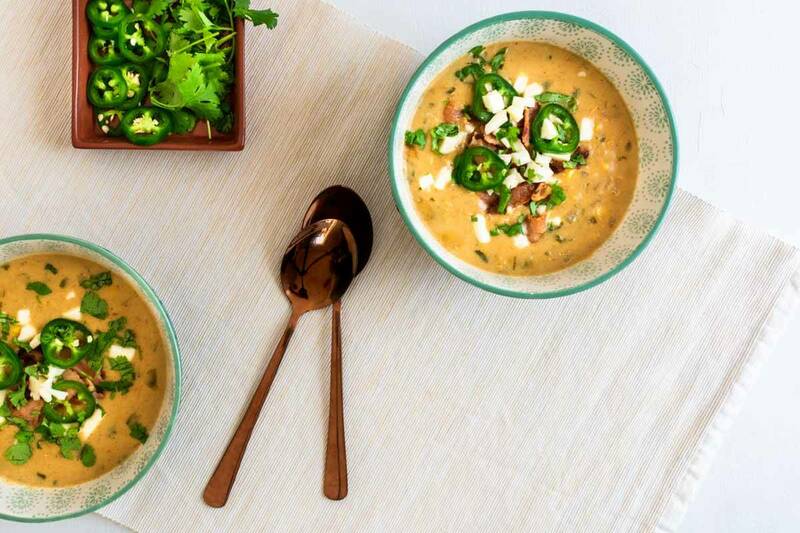 This corn soup recipe is no different. It’s ready to be enjoyed in a matter of minutes. 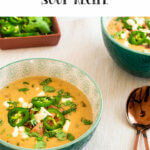 I found the original recipe on Pinterest, that led me to Rachel from the Stay at Home Chef, but I made a few adjustments to make it a healthy soup. The original recipe called for milk, but I swapped it with almond milk to make it healthier. It also adds a nice nutty flavor to the soup. To make it completely vegan and gluten-free, skip the cheese and meat garnish. You can choose to top it off with your favorite vegan substitute. Also, I found the soup to be quiet spicy, which is why I added fewer jalapeños in the recipe below. If you fancy a spicy soup then double the amount in the recipe below. 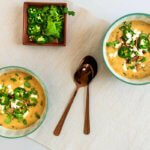 When served in small portion this Mexican corn soup recipe can be perfect for an appetizer. However, the dish is very rich so I recommend serving it during lunch instead. Serve it with a few bread slices and everyone will be eating their heart out. It will be quite a filling lunch. 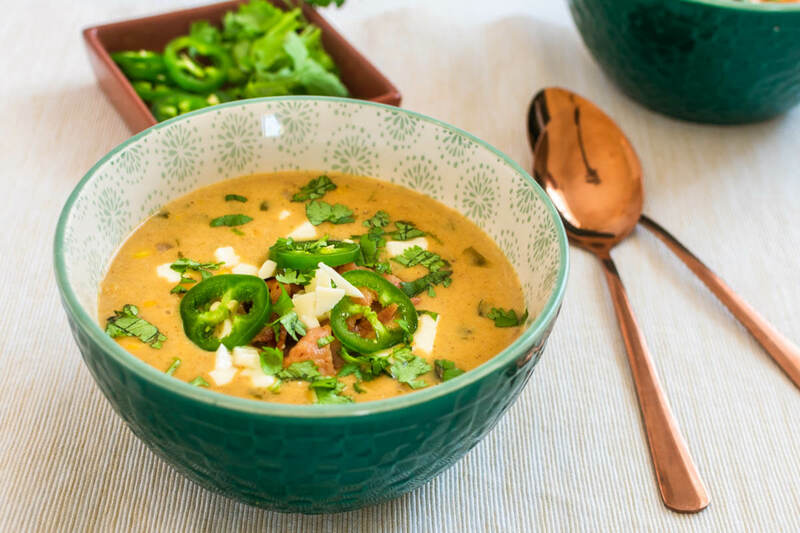 Tasty Mexican Corn Soup recipe full of flavors with a hint of spiciness and made with almond milk. A perfect dish to serve during lunch or as an appetizer. Melt the butter in a large saucepan over medium-high. Add in the onions, minced jalapeno, and sauté for about 5 minutes. Add the garlic and cook for 1 more minute. Add the flour, cumin, chili powder, stir and cook for 1-2 minutes. Add the chicken stock and whisk until smooth and all clumps are gone. Then, bring to a boil. Add in the corn, sugar, and salt. Once it starts boiling again, reduce the heat to low and simmer for 10 minutes. Stir in the almond milk and cilantro. 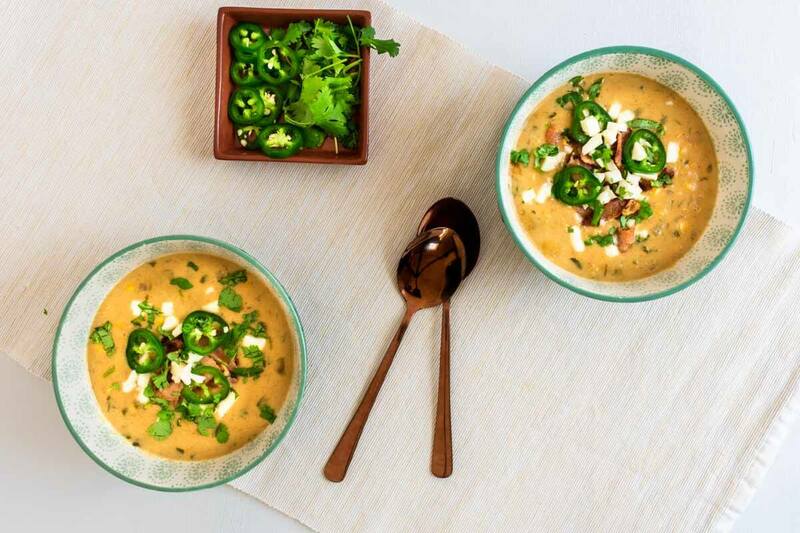 Serve the soup and garnish with bacon, white Mexican cheese, and jalapeno slices.